Ampalaya, also called bitter melon or balsam pear, makes up a staple in Indian and Chinese cuisines, and is highly regarded in tropical Asia for its medicinal properties, explains Ohio State University. Like most other veggies, ampalaya is low in calories, and each pod contains just 21 calories, or 1 percent of the calorie intake in a 2,000-calorie diet. Within ampalaya's white and bitter flesh, you'll find several essential nutrients, including vitamins that support your health. Ampalaya is low in fat -- each pod provides just a quarter of a gram of total fat -- but provide you with proteins and carbohydrates needed to fuel your active lifestyle. Each pod contains 1.3 grams of protein, which helps maintain healthy bones and other tissues, as well as 4.6 grams of carbohydrates. Some of these carbs -- approximately 1 gram -- provide fuel for your cells, while the remaining 3.5 grams come from dietary fiber, a type of carbohydrate that fights cardiovascular disease, as well as constipation and hemorrhoids. 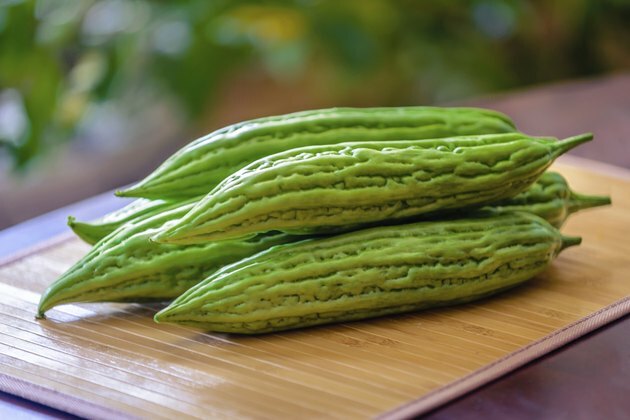 The dietary fiber found in one ampalaya provides 9 and 14 percent of the recommended daily fiber intakes for men and women, respectively, according to the National Academy of Sciences Research Council. Ampalaya's generous vitamin C and folate content promotes cardiovascular health. Folate helps you metabolize homocysteine -- an amino acid that would otherwise accumulate to toxic levels, increasing the risk of cardiovascular disease. Vitamin C reduces your cardiovascular disease risk, and a diet rich in the nutrient cuts your risk of coronary heart disease. Each ampalaya provides you with 89 micrograms of folate -- 22 percent of your recommended daily intake -- as well as 104 milligrams of vitamin C, or your entire recommended daily intake, according to the Institute of Medicine. Add ampalaya to your diet to boost your intake of vitamin A. Your body utilizes vitamin A to control gene activity -- an essential process for guiding new cell development. Vitamin A also supports new red blood cell growth and maintains healthy vision. Each ampalaya provides you with 584 international units of vitamin A, and provides 19 and 25 percent of the recommended daily vitamin A intakes for men and women, respectively, according to the Institute of Medicine. Lightly salt sliced ampalaya before cooking -- this draws out some of the liquid and improves its flavor. Enjoy it sauteed with your favorite vegetables as a side dish, or make it a main course by adding lean protein, such as shrimp, chicken breast, tofu or tempeh. Use sliced ampalaya in salads -- it pairs particularly well with tomatoes, shredded carrots and thinly sliced onion. Alternatively, combine chopped ampalaya with mango and cilantro for a healthful salsa.